Baxter’s restless and somewhat erratic pastoral work among those he termed Nga Mokai — the down-and-outs and the drop-outs, the underclass and the marginalised — between 1968 and 1972, drawing, however clumsily, on Maori cultural principles as well as Christian idealism, Newton argues, anticipated the psychotherapy movements and self-help communities of the Seventies, Eighties and beyond; while his incorporation of Maoritanga signalled the arrival of biculturalism and a gradual grudging acknowledgement by mainstream society that ‘assimilation’ was over — a drawn-out moment of realisation that reached its apogee during the Springbok Tour unrest of 1981. In re-contextualising Baxter within the broad sweep of New Zealand’s late twentieth-century history, Newton is not so much intent on rehabilitating the public Baxter with his period-era theatrical antics — the vulgar-tongued oracle out of the south storming his way upcountry to become a kind of barefoot liberation theologian nimbly arguing points of Holy Writ with the Church — but in exploring how his legacy of community idealism (‘the Jerusalem activist kaupapa’) worked itself out afterwards in the lives of the people in and around the settlement of Jerusalem/ Hiruharama on the Whanganui River. Baxter, while always hyperalert to undercurrents in New Zealand society, also anticipated the new ‘consciousness’, notably by travelling in Asia in Japan and India in the Fifties — ahead of, for example, Allen Ginsberg and the Beats — and returning with a more sophisticated grasp of the nexus of Fifties Western populist philosophical movements, such as existentialism and humanism, out of which the philosophy of the hippie movement evolved, or devolved. Baxter, in Newton’s estimate, becomes a kind of convenient peg to hang events on, in order to examine a moment of cultural transformation. The symbolic sighting of the ‘double rainbow’ that Baxter attested to stands for the newly emerging order of plurality and identity politics — and for a burying of that old colonial hang-over, the ‘fatal impact’ theory (‘Maori culture only exists in the museum’), and other such shibboleths of ‘settler nationalism’. Baxter’s satirical ballads, as well as his late religious poems, reveal him as a poet deeply sceptical about and critical of the settler nationalism narrative. What John Newton’s book ultimately confirms is that there were many Baxters, or at least many ways of approaching Baxter: through his life and times, as here — but above all through his work. Jerusalem Sonnets, Jerusalem Daybook and Autumn Testament, the three poetry collections he produced during the Jerusalem years — while subsisting on little more than chain-smoked Port Royal roll-your-owns and cup after cup of instant coffee sweetened with lots of sugar, thus hastening his death from a heart attack — are a crowning achievement; however, they need to be treated as part of a complex continuum, which, as Sam Hunt and Paul Millar reveal, with their choices of canonical poems bolstered by offerings of hitherto-unpublished poems from the copious manuscript notebooks, and reassessments of previously neglected or marginalised poems, is a work in progress. ‘We need all kinds of verse, polite and impolite, religious, elegy, epithalamium and drinking song. . .’ the twenty-four-year-old Baxter announced in a keynote talk at the 1951 Writers’ Conference in Christchurch: ‘A real poem speaks with the difficult, many-voiced, sometimes serene, often violent language of our real selves.’ In practice, the verses of JKB regularly offer the jingle of doggerel (albeit metrically precise) tossed into the the air like coins to land where they will, or tendered to specific people like bits of wise advice. Not many, if any, poets locally, though, can match Baxter for wide-ranging technical virtuosity, or the spectacular particularity of his imagery, as Millar’s selection (simultaneously published in Great Britain by Carcanet) demonstrates. Baxter was attacked in his day by Charles Brasch for churning out poetry rather than poems and by Allen Curnow for preferring the ‘eloquent’ over the ‘inquisitively precise’ word. Millar’s selection, now that the dust of ages has settled, makes it clear that, true, Baxter was never parsimonious, but that also he was a master of metaphor, a master of the appropriate verse form, and a master of the exact phrase, albeit emotionally rather than ‘inquisitively’ exact. A product of the deep south’s dour Bible Belt, who also went to Quaker schools in Wanganui (as it then was) and England, Baxter by temperament and through concomitant home-schooling — which exposed him to ideologies, ideas and literature his more conventionally educated peers were denied[iii] — was profoundly out-of-sympathy with the conformism of his day. Like Graham Greene, he brooded on childhood unhappiness and guilt, and wove memorable texts from the brooding. ‘More than half the images that recur in my poems are connected with early memories of the Brighton township, river, hills and coast,’ Baxter stated in a prose memoir. He also declared in a canonical poem-sequence: ‘Man is a walking grave,/That is where I start from …’ (‘Pig Island Letters I’). Baxter understood that myths are harder to eradicate than theories: ‘What happens is either meaningless to me or it is mythology.’ And so he mapped a mythological topography over the local landscape twice, first using the Greek and Roman pantheon (enrolled at Otago University, ‘Aphrodite, Bacchus and the Holy Spirit’ were his tutors), then using Maori cosmogony. ‘I have walked barefoot from the tail of the fish to the nose/ To say these words’ he wrote in the poem ‘He Waiata mo Te Kare’, addressed to his wife, Jacquie Sturm — a poem which both Millar and Hunt include in their selections. From the clarity of the direct utterance, to the comedy of bad manners that are his verse letters (especially the one addressed to Sam Hunt), to the delicate efflorescence of some of the last poems, Baxter celebrates the poet’s vocation as a tribal one. Selected Poems reveals him channelling the vernacular of public bar and wool shed, learning omnivorously, for example, from the British leftist poets of the Thirties — the Macspaunday school of MacNeice, Spender, Auden and Day-Lewis — but above all incarnating the transplanted, carousing, convivial spirit of Robert Burns (often to the extent of taking over whole lines: ‘When from my mother’s womb I fell’, in Burns’s ‘Holy Willie’s Prayer’, for example, reappears as ‘When from my mother’s womb I came’ in Baxter’s ‘Song of the Years’). In sum, Baxter created a still-not-completely-navigated body of verse that looms mountainously, sometimes fine-grained, sometimes coarse, with bubbling merry creeks and black tarns of ambiguous depth. Meanwhile the mills of Academe, or perhaps that should be the millstones of critical fashion, have failed in their attempts to grind Baxter small. As Sam Hunt’s selection is intended to indicate, any amount of critical noise cannot drown out that unique Baxter voiceprint for salt-of-the-earth types. One of Baxter’s early influences, the poet and Jesuit priest Gerard Manley Hopkins, advised his friend Robert Bridges that poems need to be ‘read with your ears’, and Hunt’s slim volume says the same. Along the mantelpiece. Time is a spokeless wheel. Millar, indeed, is on a kind of evangelising mission, as if reclaiming Baxter for Presbyterian or middle New Zealand, after the Wonder Kid became identified as a Roman Catholic convert as well as a dangerously wayward sinner. He shapes JKB as our once and future bard — the poet who, arguably, still has most to tell us about where we have come from, and where we might be going to. [i] ‘The best poem in Scottish literary history’, according to Patrick Scott Hogg in his Robert Burns: The Patriot Bard (Edinburgh: Mainstream Publishing, 2008). [ii] See Spark to a Waiting Fuse: James K. Baxter’s Correspondence with Noel Ginn 1942–1946, edited by Paul Millar (Wellington: Victoria University Press, 2001). [iii] Both of JKB’s maternal grandparents were eminent Victorian educators in colonial New Zealand. His mother, Millicent, received home-school tuition from both, and attended Newnham College, Cambridge, before women were permited to be graduates of the university. 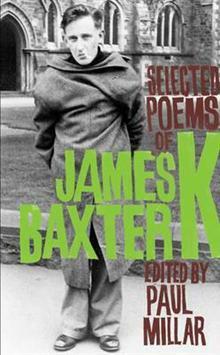 See The Life of James K. Baxter, by Frank McKay (Auckland: Oxford University Press, 1990).